are part of the Good Sam Club family! you're not only able to take advantage of exclusive savings, but you are part of our outdoor enthusiast family. Join Today and Receive up to $50 in Merchandise Certificates! Everyday Savings – Save up to 10% every day at Camping World SuperCenters & when ordering by phone. 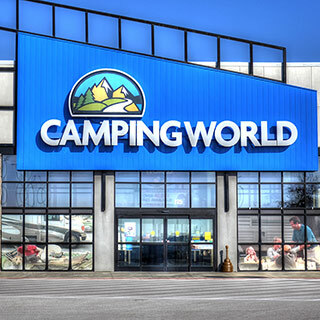 FREE Shipping – on orders of $49 or more at CampingWorld.com (Some exclusions apply). Propane Discount – Save 15% on propane at Camping World SuperCenters. 40-gallon limit. Discount is off regular retail price. Propane is available at most SuperCenters. Installation Discount – Save 10% on installation fees at Camping World SuperCenters. Service Discount – Save $10 on the posted hourly service rate at Camping World SuperCenters on your RV repair needs. (Some restrictions apply). Members-Only Specials – Enjoy members-only specials with significant savings on a variety of items. Double Discount Days – Enjoy Double Discount Days where the regular Club discount is doubled on 100s of items throughout the year. Members-Only Coupons – Save more with monthly coupons. Early Access to Events & Promotions – Be the first to know about sales & promotions. Product Protection Discount – Save 10% on Good Sam Product Protection & enjoy coverage against untimely & costly repairs. Good Sam Guide Series (formerly the Good Sam RV Travel & Savings Guide) – The only print directory of RV parks & campgrounds in North America with all the RV resources, outdoor lifestyle tips & travel tools you need for your next outdoor adventure! Members save over 65% off the retail rate – only $9.95! Free RV & Boat Dump Station Privileges – Enjoy the convenience of knowing that you can count on free dump station privileges at select Camping World SuperCenters that offer dump service. Annual Multi-Point RV Inspection – Keep your travels smooth & your RV in tip-top shape with an annual multi-point inspection at any Camping World SuperCenter. 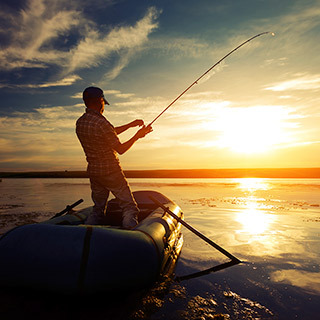 Everyday Savings – Save up to 10% every day at Gander Outdoors retail locations. 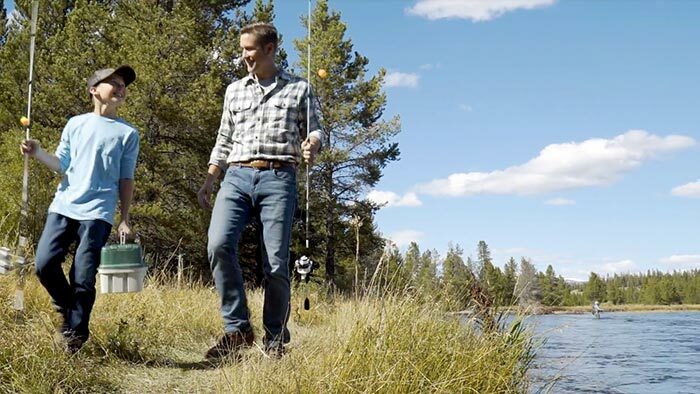 FREE Shipping – On orders over $49 at GanderOutdoors.com (some exclusions apply). Service Discounts – Enjoy 10% off all Gearsmith Shop services, 5% off at America's Gunsmith Shop, 20% off live bait, plus free line winding, knife sharpening & firearm diagnostics. Double Discount Days – Enjoy Double Discount Days in retail locations & online where the regular Club discount is doubled on 100s of items throughout the year. Everyday Savings – Save up to 10% every day at Overton’s retail locations. FREE Shipping – On orders over $49 at Overtons.com (some exclusions apply). Service Discounts – Enjoy 10% off all installation & services for boats including winterization, wrapping & storage at Overton's in Rogers, MN. Plus, 20% off live bait, and free line winding. Good Sam Travel & Savings Guide – The only print directory of RV parks & campgrounds in North America with all the RV resources, outdoors lifestyle tips & travel tools you need for your next outdoor adventure! Members save over 65% off the retail rate – only $9.95! Fuel Discount – Save 5¢ off gas & 8¢ off diesel instantly at select Pilot Flying J locations using the Good Sam Club membership card. Camping Discount – Stay at any of the 2,400+ Good Sam RV Parks & Campgrounds in the U.S. & Canada & save 10% on the regular nightly RV site rate. 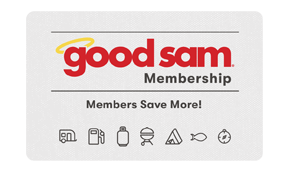 Good Sam Perks – Take advantage of online access to members-only coupons on dining, shopping, travel, entertainment & more. Plus, enjoy special partner offers throughout the year. Online Trip Planning – Easy–Quick–Free. Plan your next trip using the Good Sam Trip Planning tool. Good Sam Show Discounts – Save up to 25% off regular adult admission prices on up to two admissions at Good Sam sponsored RV shows. Receive the discount when purchasing tickets online or at the on-site ticket office by showing your Good Sam Club membership card. Exclusive Price on a MotorHome or Trailer Life Magazine Subscription – Enjoy 12 issues of MotorHome or Trailer Life magazine at a member-exclusive rate of $12.97! VIP Assistance with Roadside Assistance & TravelAssist – Good Sam Club members who are also Good Sam Roadside Assistance or Good Sam TravelAssist members now enjoy VIP Assistance! When in need of assistance, Good Sam Club member calls are moved to the front of the line! Good Sam Mail Service – This state-of-the-art virtual mailbox allows you to check your mail every day—just like home. Good Sam Club members save up to 25% on mail service plans! 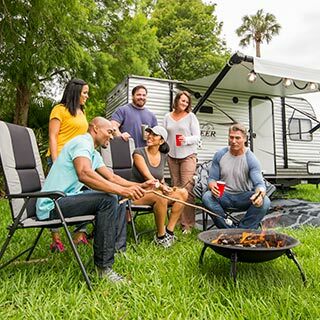 Good Sam Extended Service Plan – Club members have access to a members-only RV mechanical breakdown insurance designed exclusively by & for the Good Sam Club. Good Sam Extended Service Plan is mechanical breakdown insurance that goes above & beyond a manufacturer's RV warranty to protect RVers from the high costs associated with a mechanical breakdown. Action Line Consumer Advocacy – If members have a dispute about an RV-related issue, they can count on the Good Sam Club Action Line to help. Action Line cuts through red tape, gets answers, & works to resolve problems on members' behalf. Members Save up to 10% Every Day at Over Thousands Locations in North America! Where can I use my Good Sam Club membership? Members can use their membership at over 3,280 locations in North America! Members save at Camping World, Overton's, Gander Outdoors, Good Sam Parks, and Select Pilot Flying J locations. And More! How much does a Good Sam Club membership cost? Prices vary based on membership term. Current membership Rates are: $75 for a three-year membership, $50 for a two-year membership, and $29 for a one-year membership. How much will the Good Sam Club membership save me on fuel? 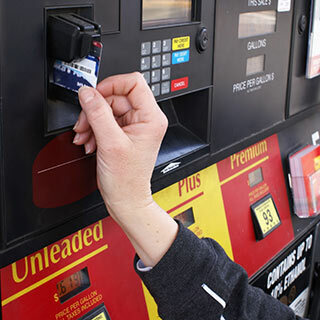 Members save 5¢ per gallon of gas and 8¢ per gallon of diesel. For more Information visit our fuel savings page. How long does a Good Sam Club membership last? Membership expiration is based on the term purchased. Good Sam Club membership benefits, promotions and/or special offers are subject to change without prior notice. Some benefits, products and services offered by the Good Sam Club may not be available to residents in certain states or outside the U.S. Some restrictions apply to certain benefits. Sales tax on Good Sam Club memberships is applicable in certain states.